Catabolite Activator Protein (CAP; also known as cAMP receptor protein, CRP) is a trans-acting transcriptional activator that exists as a homodimer in solution, with each subunit comprising a ligand-binding domain at the N-terminus (CAPN, residues 1-138), which is also responsible for the dimerization of the protein, and a DNA-binding domain at the C-terminus (DBD, residues 139-209). Two cAMP (cyclic AMP) molecules bind dimeric CAP with negative cooperativity and function as allosteric effectors by increasing the protein's affinity for DNA. CAP binds a DNA region upstream from the DNA site for the RNAP II holoenzyme. CAP activates transcription through protein-protein interaction with the α-subunit C-terminal domain of the RNAP II holoenzyme. This protein-protein interaction is responsible for (i) catalyzing the formation of the RNAP-promoter closed complex; and (ii) isomerization of the RNAP-promoter closed complex to the RNAP-promoter open complex. Cytosolic cAMP levels rise when the amount of glucose transported into the cell is low. CAP has a characteristic helix-turn-helix structure that allows it to bind to successive major grooves on DNA. The two helices are reinforcing each, causing a 43° turn in the structure, so overall causing a 94° degree turn in the DNA. 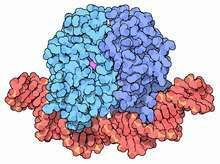 This opens the DNA molecule up, allowing RNA polymerase to bind and transcribe the genes involved in lactose catabolism. cAMP-CAP is required for transcription activation of the lac operon. This requirement reflects the greater simplicity with which glucose may be metabolized in comparison to lactose. The cell "prefers" glucose, and, if it is available, the lac operon is not activated, even when lactose is present. This is an effective way of integrating the two different signals. CAP is responsible for catabolite repression, a well-known example of a modulon and also plays a role in the Mal regulon. 1 2 Busby S, Ebright RH (2001). "Transcription activation by catabolite activator protein (CAP)". J. Mol. Biol. 293 (2): 199–213. doi:10.1006/jmbi.1999.3161. PMID 10550204. 1 2 Lawson CL, Swigon D, Murakami KS, Darst SA, Berman HM, Ebright RH (2004). "Catabolite activator protein: DNA binding and transcription activation". Curr. Opin. Struct. Biol. 14: 10–20. doi:10.1016/j.sbi.2004.01.012. PMC 2765107 . PMID 15102444. ↑ Busby, Steve; Ebright, Richard H (1999-10-22). "Transcription activation by catabolite activator protein (CAP)". Journal of Molecular Biology. 293 (2): 199–213. doi:10.1006/jmbi.1999.3161. ↑ Schultz SC, Shields GC, Steitz TA (1991). "Crystal structure of a CAP-DNA complex: the DNA is bent by 90 degrees". Science. 253 (5023): 1001–7. Bibcode:1991Sci...253.1001S. doi:10.1126/science.1653449. PMID 1653449.